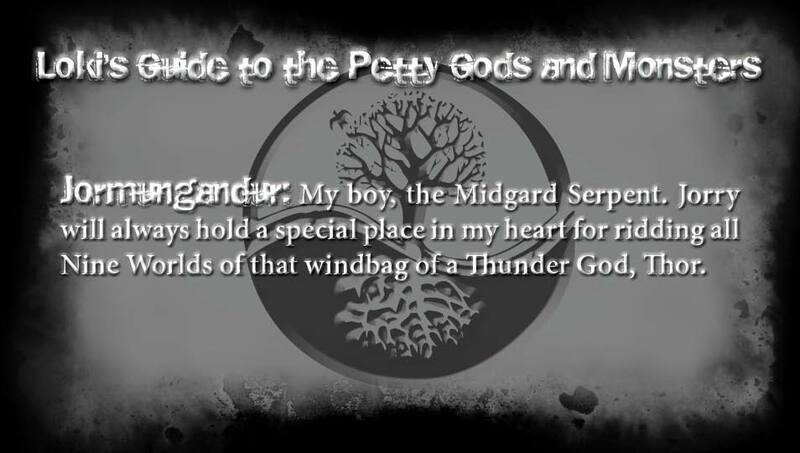 I’ve always loved the Midgard Serpent. Even when I admired Thor more than I did Loki. There was something powerful about a creature that was so vast it could encircle the world that spoke to then very tiny me. Even considering I grew up in a small town, and it was a great many years before I could fathom just how vast our world was, I knew Jormungandur was big. And even now, when every I leave my little corner of the world and travel somewhere new, I am amazed by what I see. Or…maybe I just liked Jormungandur because he was a dragon (or a sea serpent, as Loki insists to Ted in Thunder Road). Jormungandur was fated to kill Thor, but he was also fated to be killed by Thor. There are three stories of these two enemies that are commonly told, (There’s one of those magic numbers in Norse myth!) and I love them all. In one, the giant Utgard-Loki (no relation to Loki-Loki) tricks Thor by disguising the Midgard Serpent as a cat, and challenges the god of thunder to lift the beast. Thor does manage to get one of the cat’s feet off the ground–and considering Jormungandur’s size beneath that illusion, that is an impressive feet of strength. In another of the tales, Thor goes fishing with the giant Hymir and after catching two whales and Thor remaining unsatisfied, they head deeper out into the ocean. Eventually, Thor hooks Jormungandur with a hook baited with an ox-head (the head of Hymir’s largest ox, nice guy, that Thor). Before Thor can kill Jormungandur with Mjölnir, a terrified Hymir cuts the line and the Serpent sinks back into the sea. Third, and finally, is the meeting of serpent and god at Ragnarök. Thor does manage to kill Jormungandur here, but its kind of a bitter victory. Jormungandur’s breath is poison, and Thor stumbles nine steps to his death (there’s that other magic number in Norse myth). That should have been the end of the Midgard Serpent (and Thor) but I had other plans. Since I cheated Ragnarök and kept Loki alive, I thought Loki would have told his children how to escape their dooms as well, and in Thunder Road, Jormungandur lives on, making his primary residence in one of Manitoba’s largest lakes. In addition to my childhood love of Norse myth, I developed an obsession with Scotland in my teen years (I blame Highlander). But in addition to wanting to run around in a kilt swinging a claymore or lochaber axe (and trying to develop a taste for scotch long before my palette was ready) I also wanted to look for the Loch Ness Monster. There were also Champy, Ogopogo and all the other lake monsters rumoured to exist throughout the world. It was a long time before I heard of Manitoba’s own resident monster, Manipogo though. To some degree, I owe the existence of Thunder Road to Jormungandur. One of the first short stories I ever started after deciding to pursue writing seriously was one imagining that all sightings of lake monsters and sea serpents around the world, were in fact, Jormungandur. That story didn’t go anywhere, mostly because I never finished it. But there are sentences, even a paragraph or two that were lifted wholesale from that abandoned project and dropped into Thunder Road. Those words remain there, essentially unchanged. Deciding to overlap the Nine Worlds of Norse Mythology and my world, that is a debt I owe a debt to the big guy. Next up on Loki’s Guide to Norse Mythology: An even bigger guy. The biggest, in fact. Ymir, the primordial frost giant! 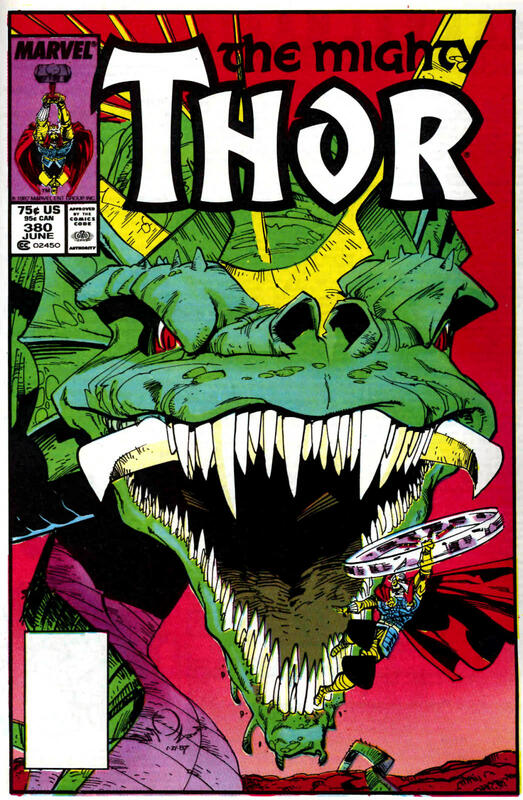 This entry was posted in Uncategorized and tagged Champy, Jormungandur, Lake Monster, Loch Ness Monster, Loki, Loki's Guide to Norse Mythology, Manipogo, Mjölnir, Ogopogo, Ragnarök, Thor, Thunder Road, Walt Simonson, Writing by chadwickginther. Bookmark the permalink.